Not to be confused with Sixteen Candles. 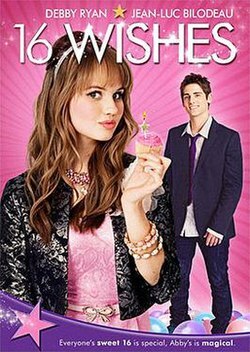 16 Wishes is a 2010 Canadian-American television teen film starring Debby Ryan and Jean-Luc Bilodeau, which premiered on June 25, 2010 on Disney Channel and July 16, 2010 on the Family Channel. The film was directed by Peter DeLuise and written by Annie DeYoung. The film was the most watched cable program on the day of its premiere on the Disney Channel. In addition, 16 Wishes introduced Debby Ryan to new audiences, such as the contemporary adult audiences since the movie received high viewership in the adults demographic (18–34). The film was the second most watched program on cable on the week 16 Wishes premiered. It was the second film to be released on the Disney Channel in 2010 that was not promoted as a "Disney Channel Original Movie" (after Harriet the Spy: Blog Wars) and is a co-production between Disney Channel, Family Channel and the Canadian production company MarVista Entertainment. In other countries, it is advertised as Disney Channel Original Movie. It was planned to have its UK premiere on November 19, 2010 on Disney Channel UK, but was replaced with Starstruck, which had already been shown in May; it was later shown in December 2010 in the UK. Abby Jensen has been planning for her sweet sixteen birthday since she was a little girl. She keeps a list of wishes that she wants to come true. When the big day finally arrives, she excitedly adds her sixteenth and final wish to the list: a photo of Logan, her crush. Her parents and her brother Mike surprise her, but she rejects them. Then begins the first of many unusual occurrences, each involving visits from a peculiar woman, Celeste. She first appears as an exterminator when the Jensens' house gets overrun by wasps from a nest that had been building up for 16 years. Celeste saves Abby's wish list, but the family is unable to go back inside their house until the wasps are exterminated. Abby's best friend, Jay Kepler, appears and offers Abby his jacket. When Abby reaches into a pocket, she finds a birthday present for her - a necklace with a half of a heart saying "BFF." Jay uses the other half as a charm on his key ring. A delivery truck pulls up, and Celeste comes out dressed as a mail woman and gives a package with 16 candles and a matchbox to Abby. Abby lights the first candle, her first wish, meeting celebrity Joey Lockhart, is fulfilled. Abby then realizes that the candles correspond to the wishes on her wish list. Abby lights up the eighth candle and her wish for a red car is fulfilled. Out of the car comes Celeste. Abby realizes Celeste is a magical being. Abby unsuccessfully tries to make a third wish. Celeste explains that Abby must wait to make new wishes within new hours, and that, at midnight, Abby's candles expire and the wishes she made will be permanent. Abby makes more wishes, causing her to beat her nemesis, Krista Cook, in a volleyball match, and become Student Body President. Abby remembers that she needs a dress for her birthday party and decides buy it with Jay, who agrees to pay for it. They are followed by Krista, who takes Jay's wallet when he drops it. She convinces the store clerk that the two are not actually going to buy anything; the clerk kicks them out. Abby uses the 9th candle to make a wish to be treated like an adult, which adds consequences of adulthood that she did not think of. Abby is suddenly not allowed to attend high school anymore, and no one at school remembers her, not even Jay. Her parents buy her a new apartment and leave her to live on her own. Regretting her wish, Abby unsuccessfully tries to make new wishes and change some. Abby makes a wish for her parents to understand her; her parents do understand her, but under the impression that she is an adult. Abby walks by Krista's Sweet 16 and spots Jay. She restores Jay's memories that they are best friends by showing him the necklace he gave her. However, Jay is unable to help her. Abby talks to Krista, and realizes that she is on good terms with her in adulthood. She also realizes that Jay wanted to be Student Body President all along. Desperate, Abby returns to her apartment, where Celeste appears. Abby talks with Celeste as she tells her how selfish she was for not thinking about her friends and family seeing that she been thinking about herself due to not seeing what she already had. Abby eventually found a loophole through the rules of magic because her last wish was glued on with gum, acting as a "barrier" between the picture and the rules. She switches the picture for a picture of her taken that morning and wishes she could go back to that morning right before midnight strikes. Abby's life then goes back to normal. Abby throws her wish list away and gives her money to Mike for a guitar. Abby finds Krista carrying posters saying 'Vote For Krista.' She and Krista reconcile after Krista tells Abby that she dislikes her because she took Jay away from her as a friend. Abby and Krista stop competing and work together to make Jay Student Body President, fulfilling his dream. Abby and Krista have a joint birthday party. Krista and Logan become a couple, and Mike's talent is recognized. Abby tells Jay that she has no more wishes, and they kiss. Celeste then turns into a fairy and flies away. The couples - Abby and Jay and Krista and Logan - then dance together at the party. Some scenes were filmed at Walnut Grove Secondary School in Langley, British Columbia. 16 Wishes is the soundtrack album for the film of the same name, released on June 15, 2010, by MarVista Entertainment. The movie garnered over 5.6 million viewers in its first showing. The film went on to become the most watched cable program on the day of its premiere on Disney Channel. The Sunday airing of the film received over 4.0 million viewers. ^ "World Premiere Of '16 Wishes' Is Friday Cable's No. 1 Telecast In Total Viewers". Archived from the original on 3 July 2010. Retrieved 2010-06-22. ^ "Friday Cable Ratings: 16 Wishes Premieres Big; Party Down, Gravity Finales Finish Small". tvbythenumbers.com. Archived from the original on 2 July 2010. Retrieved 2010-06-22. ^ "Cable TV Top 25: BET Awards, 16 Wishes, USA/Algeria Match Top Week's Cable Shows". Archived from the original on 2 July 2010. Retrieved 2010-06-22. ^ "16 Wishes Soundtrack1". iTunes. Retrieved June 4, 2011. ^ "Archived copy". Archived from the original on 2010-07-02. Retrieved 2010-09-14. CS1 maint: Archived copy as title (link) Cable TV Top 25: BET Awards, 16 Wishes, USA/Algeria Match Top Week's Cable Shows! ^ "Get Your Hands Dirty". The West Australian. 3 August 2010. Features, p. 2. This page was last edited on 11 March 2019, at 05:37 (UTC).